Graduation rates are improving at the majority of four-year public colleges and universities, but the gains in graduation rates are not equal across all races and ethnicities. The Education Trust, a nonprofit group, dove into the numbers with a report out earlier this week. Researchers found that institutions have had varied levels of success ― or lack of success ― with improving their Black student graduation rates. The report singled out the University of Missouri–Kansas City (UMKC) in particular, where the Black graduation rate has gone down, even as the graduation numbers for White students went up. The Education Trust praised the efforts of institutions like The Ohio State University and the University at Buffalo, which have both turned around the graduation prospects for its Black students. “Rising Tide II” does a good job of measuring one piece of the big picture for African American students: the success rate of those who gain admission to various colleges and universities. Unfortunately, it ignores another vitally important factor: access to a college education. We ran a search for the word “access” in the 16-page Rising Tide II report; it does not appear anywhere in the document. A highly selective university can gain bragging points for its graduation rate simply by closing its doors to anyone who risks failure. These schools do a fine job of educating the students who get in, but do nothing for those left standing outside the gates — or for the underprivileged urban communities in which many of them live. As an urban-serving public university, UMKC takes great pride in providing a high level of access to our community and region. Providing opportunity to those who must overcome obstacles on the path to a degree ― people with great drive, intelligence and talent, but whose success is by no means guaranteed ― is a core value. This is illustrated by Common Data Set reports for the 2014-15 academic year on ACT scores for incoming freshmen at the four institutions highlighted by the Education Trust. 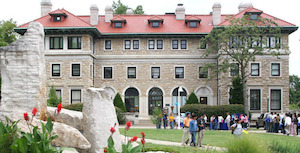 At UMKC, 50 percent of the incoming class scored between 21 and 27 on the ACT. At Ohio State, 50 percent of the incoming class scored between 27 and 31; at the University of Buffalo, 50 percent scored between 24 and 29. A quarter of the UMKC incoming class scored below 21 on the ACT; at Ohio State, 25 percent scored below 27. In a nutshell, UMKC is providing a greater level of access to Black students, providing an opportunity to them, than are Buffalo and OSU. The statement went on to enumerate the diversity initiatives UMKC has put in place since joining the Access 2 Success (A2S) in 2009, such as redesigning its general education program, college algebra; its development of Major Maps, which are intended to help students stay on sequence as they pursue their degree; and others. “Our goal was, and is, to close the gaps in both access and success between white students and those who are black, Hispanic or Native American (or Underrepresented Minorities) as well as low income students and those who are non-low income,” the university stated. UMKC also said that the student cohorts evaluated in the study would have graduated from the university between 2003 and 2013; and therefore the students who would have felt the impact of A2S-related initiatives would not be fully represented in the report.